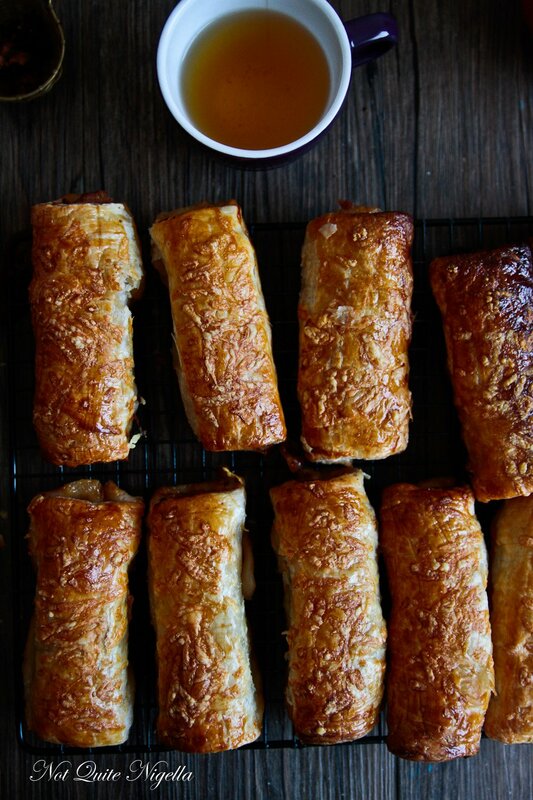 A smokey and terrifically tasty version of the classic sausage roll, this version is boosted with lashings of bacon and cheese as well barbecue sauce as a hit of liquid smoke. The puff pastry shell is then sprinkled with more cheese and then baked until golden. I dare you to eat just one! Dear Reader, I'm leaving Mr NQN soon. And no it's not because he has been bad although last night while he was having a shower and I was brushing my teeth, he gleefully rubbed his bottom against the glass between us so hard that it broke the glass partition (this actually happened, I just wish I caught it on video!). He was so proud of his bottom wiggle and he did a great job of cleaning the glass. Until it broke. I'm being dramatic, I'm just going overseas for a trip to Taiwan soon and I'm leaving my dear husband behind. Which means one thing, that the poor soul has to fend for himself food wise. He is more than capable of doing this, it's just that of course he doesn't care to. Meals will be skipped along with crucial hydration breaks and I will come home to a skinnier version of a husband. I am not kidding. Sometimes he goes down a size depending on how long I've been away. I've figured out by now there is one thing that he always eats: sausage rolls. I make a couple of big boxes of these and they always get eaten. Even though he says that he doesn't like pastry, he absolutely adores it when it is wrapped around sausage filling. Sausages rolls in any form will get him smiling in delight and it helps cushion any ill feelings about abandonment. I decided to do a smokey bacon and cheese version for him. 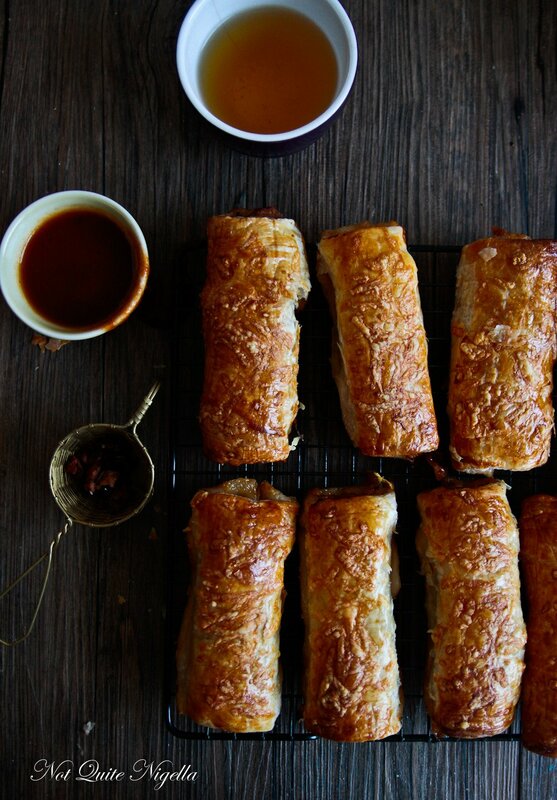 Like all sausage rolls, they're very easy to do and don't require much preparation except for mixing ingredients together and rolling up pastry. I wanted to emphasise the smoky aspect to bacon so I added some barbecue sauce and liquid smoke to give them the requisite amount of flavour and smoke. And I know that sometime during the week that I am gone, he will send me a picture of the empty container showing me how quickly he demolished them. So tell me Dear Reader, do you ever skip meals because you can't be bothered to eat? And when you go away do you leave food for people left at home or do they take care of themselves? Pssst! To follow me on my Taiwan trip, follow me on Instagram! Step 1 - Preheat oven to 220C/440F. 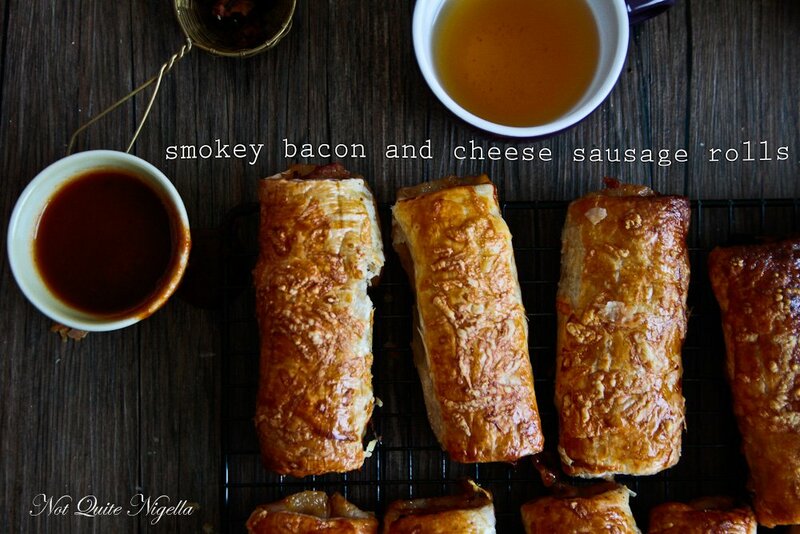 Mix the pork mince with the bacon, cheese, bbq sauce and a few drops of liquid smoke. Add a fat pinch of salt and pepper and mix to combine. Heat a frypan and fry a little of the filling and taste for flavour. If you need more salt or pepper add it and then taste until you get it just right. Step 2 - Remove the puff pastry sheets from the fridge and cut them into rectangles. 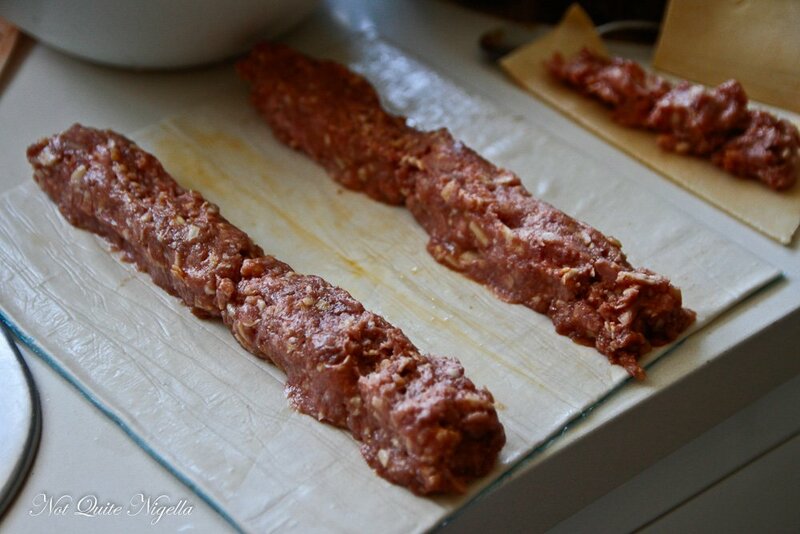 Fill the centre with a sausage shaped portion of the filling as shown. Brush the edges with the egg wash and roll up the pastry pressing down to seal gently. Repeat until all of the sausage filling is used. Brush the rolls with egg and grate a little cheese on top. If you have time, place in the fridge for 30 minutes for the pastry to firm up. Step 3 - Bake for 25 minutes or until golden brown. Serve with extra bbq or tomato sauce. recipeCocktail Party Hawaiian Sausage Rolls With Pineapple Relish! recipeMy Funny Valentine: Homemade Bacon for His Valentines Day! featureWin 1 of 5 King Island Dairy Award Winning Cheese Packs! recipe Cocktail Party Hawaiian Sausage Rolls With Pineapple Relish! recipe My Funny Valentine: Homemade Bacon for His Valentines Day! feature Win 1 of 5 King Island Dairy Award Winning Cheese Packs!